The 15 Best Activities for College Students in Wisconsin! College is considered to be the best time of your young adult life. So when you’re not studying, you better be out there having fun on campus and in the community. Escape from campus for the night, put down the books, and check out these fun activities for college students in Wisconsin. The Badgers are Wisconsin’s prized Division I possession. The Big Ten Conference is always great competition—especially for football. Attended one of the most decorated teams, at one of the coolest stadiums, in one of the country’s biggest party towns. Madison is sure to not disappoint. Come watch Wisconsin’s only professional MLB team bat at the, ever so stoic—Miller Park. Tickets are generally always cheap for nose bleed seats, but let’s face it, most college students are there for the notorious tailgating festivities. Since its start in 1969 the first Saturday in May denotes the annual Mifflin Street Block Party held in Madison, Wisconsin. This annual party isn’t only detained to Mifflin Street and partygoers aren’t only Madison students—which is why local police have always been on high alert. Party or people watch with the best of them in Madison. Summerfest is the world’s largest music festival and it attract a number of college students from all over the country. Not only notorious for its great music lineup, Summerfest has excellent food, drinks, and kiosk stands. Shuttles, buses, taxis, and Ubers stand by to take you home safely after an unforgettable night dancing, jamming, and enjoying a few Milwaukee brews. Oktoberfest in La Crosse has been rocking for over five decades. While the college festivities location might not match up with the actual city planned event—it’s definitely on the college students bucket list. Students dress up, purchase matching t-shirts, and get started on their festivities early in the day. There’s no telling how much beer is consumed in La Crosse, Wisconsin, during this annual party weekend. Pack yourself and 15 other friends on board the Pedal Tavern and drive around the historic city of Milwaukee. Drink deals are set up at a number of bars, and don’t worry the moving tavern is operated by a designated driver compliments of the company. Perfect for a bachelor/bachelorette party, showing a group of friends around the town, or jazzing up your typical weekend plans. Stay in shape throughout the school year by joining an intramural team. Teams are forming for all types of sports throughout the year. Check out the website, plug your Wisconsin based school in and sign up today! Intramurals are a great way to stay in shape and meet people with similar interests as yourself. The Wisconsin Dells are a must-visit for college students. Your weekends don’t have to be a broken record bar scene—mix it up and plan an exciting weekend away. Great hotel and waterpark deals are always circulating the Internet—plus the Dells has so much more to offer than just their waterparks. Check out their theme parks, shopping, nightlife, and great dinner venues. Attention all money strained students: Marcus Theater offers $5 movies every Tuesday and Thursday. 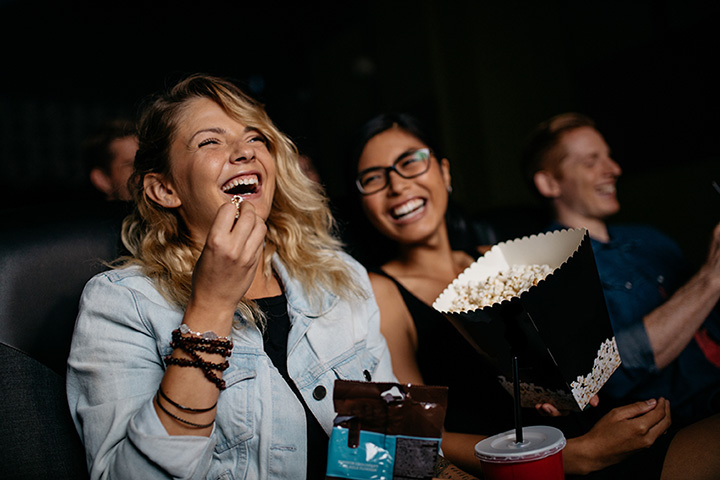 Become a member of the Magical Movie Rewards and get free popcorn every Tuesday at select cinemas. Then on Thursdays bring your student ID in to anyone of the Marcus Theater locations for only $5 admission tickets and free popcorn. Cheap and easy study breaks or date nights! Hop on the wine and painting bandwagon by having a creative night out. Search for your specific city, dates, and final masterpieces to decide which you would like to do. Enjoy instructor lead painting sessions while enjoying food and drinks. Although the night can get pricey it’s definitely a step away from your normal night out. Ski, snowboard, or snow tube at cascade Mountain in Portage, Wisconsin. Cascade Mountain has 36 trails and snow tube chute that’s 800 feet long. A $9 million expansion is currently underway adding to their already impressive terrain. Come shred the slopes when temperatures get cold enough for Cascade to make their own snow. There are two pub crawls every year in Oshkosh (spring and fall). Every year the students and their friends from all over get together and try to hit as many bars as they can in the area. While the city and local law enforcement have been apprehensive about its continuance, the students insist on keeping the tradition going, plus all the festivities does well for the economy in Oshkosh, Wisconsin. New Glarus Brewing Company is one of Wisconsin’s most well known brewing companies. Grab some buddies and find out how all the magic is made—or should we say fermented. Free self-guided tours are available as well as their Hard Hat Tours for a little extra. They have a great gift shop and a tasting room (under $10). The town of New Glarus has a charming presence, there’s so much to do for the weekend or for just the night. Zoos are still cool, even to college kids. What’s even better are free zoos. The Henry Vilas Zoo asks for donations for but technically is free to the public. There are so many interesting animals and exhibits that call Henry Vilas home. Stop by the zoo while you make your next stop in Madison! The La Crosse Bluffs at Grandad Bluff Park are a perfect day trip if you’re in the area. Get some exercise and catch some of the best views in Wisconsin while you’re at it. A convenient shelter was built on top for views of the Mississippi River, the town of La Crosse, and the bluffs in Minnesota.